Home » Blog » Movies » Superhero Fatigue? Pshaw! I’ve seen Avengers: Infinity War three times. While the fandom of some folks leans toward Doctor Who, Lord of the Rings, or Star Wars, I’ve always been a Marvel Zombie. As a small child, I partially learned to read from the comics, and the characters helped me develop what passes for a moral code. But there’s one thing that’s nagged at me ever since Iron Man was released — do these films absolutely have to be live action? Consider the aforementioned Infinity War. According to the Wall Street Journal, the most recent installment in the Marvel Cinematic Universe had a production budget a little less than $300 million. Now, consider that Pixar’s animated films Up and Brave had respective budgets of $175 million and $185 million. That ain’t chump change, but more than $100 million cheaper? Come on. Really, though? I think it’s about respectability. Like the superhero genre, animation is an art form that, by and large, isn’t respected here in the good old United States. The knee-jerk response for many people seems to be that animation equals cartoons, and cartoons are for children only. You could point to more mature examples of animation like the haunting Grave of the Fireflies, yet the majority of animated American features are made and marketed toward kids. That’s okay, because there’s still examples of sublime artistry at play. The Lego Movie is a smart critique of conformity. The Iron Giant is a touching anti-war film. Ratatouille is about the ups and downs of the creative process. Two of those three examples came from Brad Bird, an enormously talented filmmaker who worked in animation for years, made a couple of “real” movies,* and returned to the world of animation with Incredibles 2. It’s a highly welcome follow-up to his 2004 The Incredibles, and if a wait of a decade and change brings this level of quality, I’ll take it. Speaking of the original film, you might give it a watch beforehand, because the sequel picks up pretty much immediately after the first film ends. Subterranean villain The Underminer (an amusing John Ratzenberger) attacks Metroville in an entirely non-subtle bank robbery. That’s the bad news, but the good news is that the superheroic Parr family is there to stop him. There’s Bob/Mr. Incredible (Craig T. Nelson), the superstrong patriarch of the family. 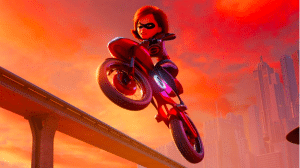 Helen/Elastigirl (Holly Hunter) is the stretchy and level-headed mom. Teenage daughter Violet (Sarah Vowell) can turn invisible and conjure force fields, while her hyperactive little brother Dash (Huck Milner) would give The Flash a run for his money in terms of super speed. Remember when I said that the good news is that the Parr family is there to stop The Underminer? What I actually meant was, the Parr family chases the villain, causes a massive amount of damage throughout the city, and allows him to escape. In a clever bit of plotting, city officials are furious the heroes got involved. If they hadn’t, the bank’s loss would have been covered by insurance, and the destruction would have been minimized. This thinking is why superheroes have been outlawed by the government. Tech mogul Winston Deavor (Bob Odenkirk) disagrees. He’s partnered with his sister Evelyn (Catherine Keener), and they make an offer to the Parrs. To make supers great again, they’ll install body-cams on superhero uniforms. If the public can see the tough decisions heroes make while doing battle, Winston is sure the public will clasp them to their collective bosom again. Winston wants the focus to start with Elastigirl, since she tends to be a smidge less destructive than her husband. She gets a slick new costume, new motorcycle, and positive media coverage. She’ll need it to combat the mysterious Screenslaver, an antagonist hypnotizing the public through its love of screens. As for good old Bob, he’s disappointed not to be back in action and making with the punching and the hitting. He won’t have time to dwell on it, since he’s now a stay at home dad grappling with the difficulties of dating, new math,** and his youngest child Jack-Jack suddenly manifesting an assortment of powers that would make the X-Men jealous. We’re living in a media landscape positively littered with superheroes. For an animated comedy about metahumans, a lesser film might made snide Deadpool-esque asides about the tropes of the genre. 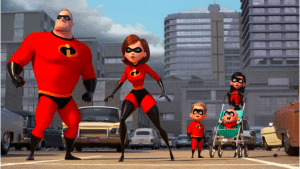 Despite having a profoundly boring title, Incredibles 2 is content to do its own thing with wit and style. Bird writes the screenplays for his animated films, and one of his favorite themes is the rejection of societal norms. He’s written about a war robot renouncing violence, and a rat yearning to be a gourmet cook. Here, we have a mom getting back out into the professional world, a dad stepping up his parental responsibilities, and a teen reconciling her family responsibilities with her desire to go on a date with a cute boy. While the script is a bit more plot heavy than the original, most of the characters get strong arcs. Speedster Dash is underwritten, and while he’s never not an annoying motormouth, he’s usually a fun annoying motormouth. 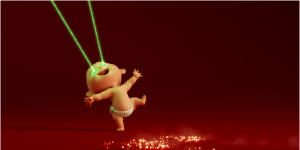 While Jack-Jack doesn’t have a character arc as such, there’s a highly entertaining scene involving him battling a luckless raccoon that would make Chuck Jones proud. For this film to perform at the level it does, it needs a finely tuned voice cast. Samuel L. Jackson is having a blast as the silky-smooth Frozone, and it’s nice to see…er…hear him in a role where he’s cutting loose. I liked Craig T. Nelson’s Bob as a decent but slightly grumpy dad who’s a touch resentful he’s not out saving the day, and Sarah Vowell’s Violet is an inspired comic creation, particularly her adolescent habit of SAYING certain words UNNECESSARILY loudly FOR NO REASON. The MVP is Holly Hunter as Elastigirl. Big surprise there, since Hunter is such a powerful actor she’s got the ability to condense a monologue’s worth of information into a single line. 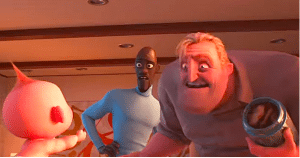 Incredibles 2 is rock solid family entertainment, made with care and intelligence. Is it as good as the first film? It’s been a minute since I’ve seen that, so I’ll have to let you know. What I do know is that a tanker truck full of money needs to be backed up onto Brad Bird’s lawn for him to make an animated Fantastic Four movie. Let Bird play with the iconic family of superpowered explorers, cast John Krasinski, Lupita Nyong’o, Michael Chiklis, Lakeith Stanfield, and Mads Mikkelsen. Boom, you have a $250 million opening weekend. Marvel Studios, you know where to send my check. *Sentences like that make me wish a sarcasm font existed. **I appreciated a scene where, after a little judicious research, Bob is able to help Dash with his math homework. Come on, guys, Common Core isn’t that hard! ***Do yourself a favor and stick around through the end credits. While there’s no post-credits scenes, you’ll be treated to a solid jazz concert including the amusing theme songs of the main supers.